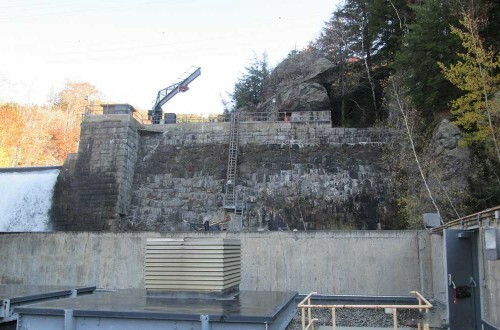 Bolton Falls Penstock Condition Assessment - DuBois & King, Inc.
DuBois & King provided a FERC-level inspection and condition assessment report of the existing penstocks at the Green Mountain Power Bolton Falls Hydroelectric Facility located on the Winooski River. 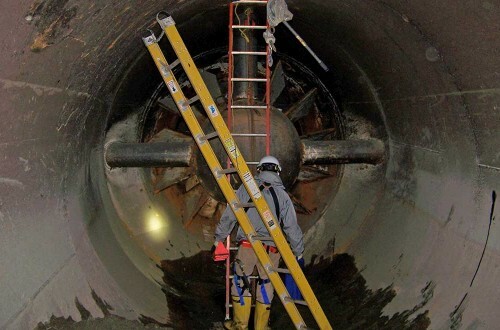 The facility consists of an intake structure, two 10-ft diameter welded steel penstocks encased in concrete, two horizontally mounted tube turbines with fixed blades, two generator units, a powerhouse, and a tailrace structure. The penstocks were visually inspected from the intake structure to the beginning of the scroll case; the combined length of both penstocks is 264 lf. Inspection consisted of visual observations, a visual coating survey, shell thickness readings using an ultrasonic thickness gage, and shell soundings. 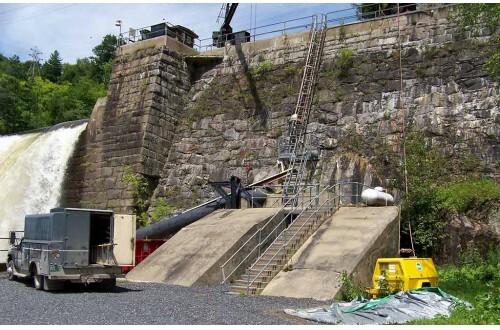 Portions of the penstocks were inspected using rope access due to a 33 degree inclined section. A condition assessment report was prepared subsequent to the inspection. This report documented the inspection activities and provided a summary of collected field data, stress analysis calculations, and recommendations.